Discussion in 'PC Hardware and Software' started by superm4n, Jul 27, 2012.
reformated it , reinstalled the drivers .. any inputs on this ? Is the problem intermittent or regular ? looks like an issue with the SATA controller. Can you change the sata port on the mobo and test?? did you do any changes in the system setup?..any new components added?.. Yup do try changing the cables and plug in to another SATA port. so its a mobo or bios issue. Check bios to ensure all settings are correct. No sata ports should be disabled or running at lower speed. Dma or ide mode etc. 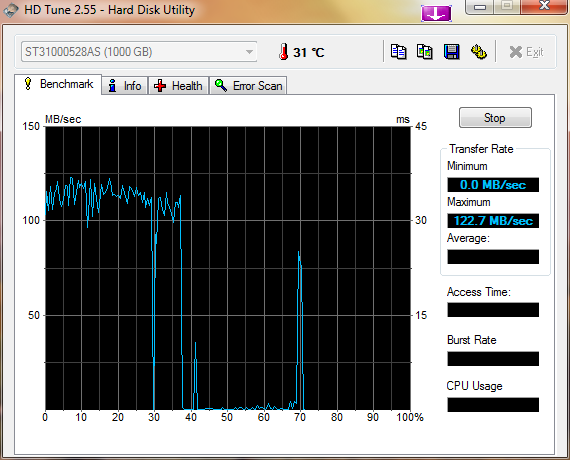 JD it doesn't look like it's running in DMA or IDE mode since the max speed is 125mb/s. I highly suspect a weak south bridge on the mobo. best thing to do is check the HDD on another machine. This will rule out the HDD. OS is most likely fine as other HDDs are working correctly. in most motherboards, there are separate controllers for SATAII and SATAIII Ports.